Art and Comic Fans, It’s Time for VAX2018! Visual Arts Expo 2018 (VAX2018) is the fourth time the show has come back, bringing together creatives in a one-stop location for both locals and international content. Artists such as Dave Ross, FUMIO and representatives from Studio Orange headlines this year’s guest lineup. It will be held at the Shah Alam Convention Centre (SACC), with its continuing goal to gather, present ideas and portfolios of people in the creative industry to interested parties, and to find opportunities both big and small. This year, VAX2018 is proud to present many great names for the event. This includes Studio Frontwing, one of the major players in the Visual Novel genre. Illustrators from the studio – FUMIO and Yosai Kuchu – will be joining VAX2018 as guest creators, alongside director Keiichiro Kawaguchi. FUMIO is well known for works such as the Grisaia series while Yosai Kuchu has created intricate art for content such as ISLAND and Queen’s Blade. Keiichiro Kawaguchi, meanwhile, is no stranger in both the anime and game world with titles under his belt such as Zettai Karen Children, Hunter x Hunter: The Last Mission, Frame Arms Girl and also Hayate The Combat Butler. VAX2018 is also proud to present Dave Ross as special guest creator. Dave is no stranger to the comic book universe, with his name attached to comics from both Marvel and DC. He has worked with multiple IPs such as Iron Man, Daredevil, Star Wars, Justice League of America and Spiderman, to name a few. Waki Kiyotaka brings the best of both worlds to the table. He has worked in iconic and memorable anime titles such as Wolf Children and the Land of the Lustrous, as well as western concept titles like the recent Iron Man animated series. Hige Driver brings some music to the scene, with his spin as a DJ as well as his experience in creating main-stream anime music like in the recent Umaru-chan R series. VAX2018 targets an audience of school leavers, fresh graduates, young adults, and entrepreneurs. 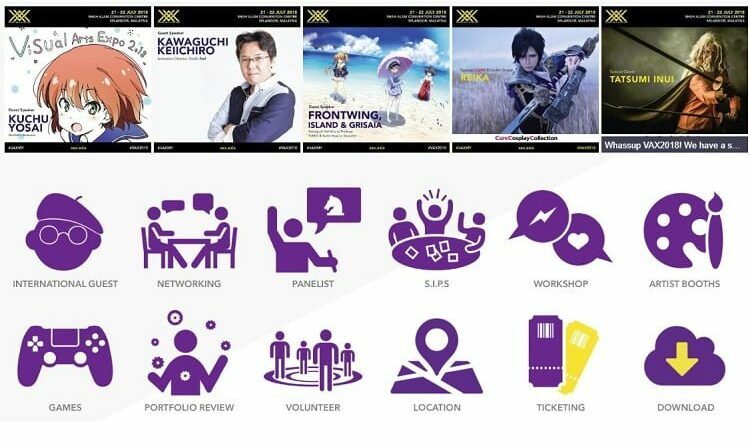 The event will present content in various forms – including (but not limited to) animation, comics, video games and music. VAX2018 will be a two-day event, running on 21st and 22nd July 2018 at the Shah Alam Convention Centre. There will also be panels and seminars by invited guests, past presenters and the public on both days of the event. These seminars and panels are open to the public.